"This is a difficult subject: by long tradition the happy hunting ground for robust speculation, it suffers much because so few can separate fact from fancy." That didn't stop people from putting forth explanations of climate change. A scientist would come up with an idea about how certain factors worked and explain it all in a page or two, helped along by some waving of hands. Some scientists went on to build a few equations and calculate a few numbers. At best they could show only that the factors they invoked could have effects of roughly the right magnitude. There was no way to prove that some other explanation, perhaps not yet thought of, would not work better. These mostly qualitative "theories" (in fact, merely plausible stories) were all anyone had to offer until digital computers came into their own, late in the 20th century. Until then, the climate community had good reason to keep theory at arms' length. Even those who tried to think in general physical terms hesitated to call themselves "theorists," an almost pejorative term in meteorology. The science did have a foundation, at least potentially, in simple ideas based on undeniable physical principles. The structures that scientists tried to build on these principles were often called "models" rather than "theories." Sometimes that was just an attempt to hide uncertainty (a paleontologist complained that "'model'... is just a word for people who cannot spell 'hypothesis'"). (3) But calling a structure of ideas a "model" did emphasize the scientist's desire to deal with a simplified system that one could almost physically construct on a workbench — something that embodied a hands-on feeling for processes. The great trick of science is that you don't have to understand everything at once. Scientists are not like the people who have to make decisions in, say, business or politics. Scientists can pare down a system into something so simple that they have a chance to understand it. Asked about changes in climate, most climatologists at mid-century would think of the extremes that people should plan for  the worst heat wave to be expected or the "hundred-year flood." If there was any pattern to such changes, experts believed it would be cyclical. Rather than try to build a physical theory, those who took any interest in the question mostly looked to numerical studies. Perhaps eventually someone would find correlations that pointed to a simple physical explanation. The varying number of sunspots, for example, might signal changes in the Sun that correlated with climate cycles. Almost everyone believed in the natural world's propensity to automatically compensate for change in a self-sustaining "balance." If climate ever diverged toward an extreme, before long it would restore itself to its "normal" state. As evidence, the atmosphere had not changed  or at least not extremely radically  over the past half-billion years. (8) And scientists came up with plausible regulating mechanisms (some of them are described below). The approach expressed a generally sound intuition about the nature of climate as a process governed by a complex set of interactions, all feeding back on one another. But romantic views that stability was guaranteed by the supra human, benevolent power of Nature gave a false confidence that every feature of our environment would stay within limits suitable for human civilization. Issues of complexity and stability in the social structure of climate science are explored in a supplementary essay on Climatology as a Profession. Of course, there was abundant historical evidence of variations lasting a few decades or centuries, random swings or (as some thought) regular cycles. Perhaps periods of drought like the American Dust Bowl of the 1930s recurred on some schedule, or perhaps not. Far more impressive were the ice ages of the past few million years, undeniable proof that climate could change enormously. Looking farther back, geologists found evidence of much earlier ice ages, as well as periods when most of the Earth had basked in tropical warmth. Understanding these great alterations of the far past posed a fascinating scientific puzzle, with no apparent practical value whatsoever. Not until the mid-20th century would scientists fully grasp, and calculate with some precision, just how the effect works. A rough explanation goes like this. Visible sunlight penetrates easily through the air and warms the Earth’s surface. When the surface emits invisible infrared heat radiation, this radiation too easily penetrates the main gases of the air. But as Tyndall found, even a trace of CO2 or water vapor, no more than it took to fill a bottle in his laboratory, is almost opaque to heat radiation. Thus a good part of the radiation that rises from the surface is absorbed by these gases in the middle levels of the atmosphere. Its energy transfers into the air itself rather than escaping directly into space. Not only is the air thus warmed, but also some of the energy trapped there is radiated back to the surface, warming it further. That’s a shorthand way of explaining the greenhouse effect — seeing it from below, from "inside" the atmosphere. Unfortunately, shorthand arguments can be misleading if you push them too far. Fourier, Tyndall and most other scientists for nearly a century used this approach, looking at warming from ground level, so to speak, asking about the radiation that reaches and leaves the surface of the Earth. So they tended to think of the atmosphere overhead as a unit, as if it were a single sheet of glass. (Thus the "greenhouse" analogy.) But this is not how global warming actually works, if you look at the process in detail. What happens to infrared radiation emitted by the Earth's surface? As it moves up layer by layer through the atmosphere, some is stopped in each layer. (To be specific: a molecule of carbon dioxide, water vapor or some other greenhouse gas absorbs a bit of energy from the radiation. The molecule may radiate the energy back out again in a random direction. Or it may transfer the energy into velocity in collisions with other air molecules, so that the layer of air where it sits gets warmer.) The layer of air radiates some of the energy it has absorbed back toward the ground, and some upwards to higher layers. As you go higher, the atmosphere gets thinner and colder. Eventually the energy reaches a layer so thin that radiation can escape into space. What happens if we add more carbon dioxide? In the layers so high and thin that much of the heat radiation from lower down slips through, adding more greenhouse gas means the layer will absorb more of the rays. So the place from which part of the heat energy finally leaves the Earth will shift to higher layers. Those are thinner and colder layers, so they do not radiate heat as well. (11a*) The planet as a whole is now taking in more energy than it radiates (which is in fact our current situation). As the upper levels radiate some of the excess downwards, all the lower levels down to the surface warm up. The imbalance must continue until the upper levels get warmer and radiate out more energy. As in Tyndall's analogy of a dam on a river, the barrier thrown across the outgoing radiation forces the level of temperature everywhere beneath it to rise until there is enough radiation pushing out to balance what the Sun sends in. 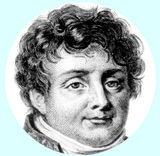 Despite Fourier's exceptional prowess in mathematics and physics, he lacked the knowledge to make even the simplest numerical calculation of how radiation is absorbed in the atmosphere. (12*) A few other 19th-century scientists attempted crude calculations and confirmed that at the Earth’s distance from the Sun, our planet would be frozen and lifeless without its blanket of air. (13) Tyndall followed with rich Victorian prose, arguing that water vapor "is a blanket more necessary to the vegetable life of England than clothing is to man. Remove for a single summer-night the aqueous vapour from the air... and the sun would rise upon an island held fast in the iron grip of frost. "(14) Tyndall needed no equations, but only simple logic, to see what many since him overlooked: it is at night that the gases are most important in blocking heat radiation from escape, so it is night-time temperatures that the greenhouse effect raises the most. These elementary ideas were developed much further by the Swedish physical chemist Svante Arrhenius, in his pioneering 1896 study of how changes in the amount of CO2 may affect climate. Following the same line of reasoning as Tyndall, Arrhenius pointed out that an increase in the blocking of heat radiation would make for a smaller temperature difference between summer and winter and between the tropics and the poles. Arrhenius stripped this down to the simple idea that a drop of temperature in an Arctic region could mean that some of the ground that had been bare in summer would become covered with snow year-round. With less of the dark tundra exposed, the region would have a higher "albedo" (reflectivity), that is, the ground would reflect more sunlight away from the Earth. That would lower the temperature still more, leaving more snow on the ground, which would reflect more sunlight, and so on. This kind of amplifying cycle would today be called "positive feedback" (in contrast to "negative feedback," a reaction that acts to hold back a change). Such a cycle, Arrhenius suggested, could turn minor cooling into an ice age. These processes were far beyond his power to calculate, however, and it would be a big enough job to find the immediate effect of a change in CO2. Arrhenius showed his physical insight at its best when he realized that he could not set aside another simple feedback, one that would immediately and crucially exaggerate the influence of any change. Warmer air would hold more moisture. Since water vapor is itself a greenhouse gas, the increase of water vapor in the atmosphere would augment the temperature rise. Arrhenius therefore built into his model an assumption that the amount of water vapor contained in the air would rise or fall with temperature. He supposed this would happen in such a way that relative humidity would remain constant. That oversimplified the actual changes in water vapor, but made it possible for Arrhenius to roughly incorporate the feedback into his calculations. The basic idea was sound. The consequences of adding CO2 and warming the planet a bit would indeed be amplified because warmer air held more water vapor. In a sense, raising or lowering CO2 acted mainly as a throttle to raise or lower the really important greenhouse gas, H2O. "I should certainly not have undertaken these tedious calculations," Arrhenius wrote, "if an extraordinary interest had not been connected with them. "(18) The prize sought by Arrhenius was the solution to the riddle of the ice ages. He focused on a decrease in CO2 as a possible cause of cooling, and found that cutting the level in half could indeed bring an ice age. But he also took the trouble to estimate what might happen if the amount of gas in the atmosphere, at some distant time in the past or future, was double its present value. He computed that would bring roughly 5 or 6 °C of global warming. This result is not far from the range that scientists would compute a century later using vastly better models  the current estimate is that a doubling of CO2 will bring some 3 degrees of warming, give or take a degree or two. Did Arrhenius end up in the same range by sheer luck? Partly, but not entirely. In the sort of simple physics and chemistry calculations where Arrhenius had made his name, you can expect to come out roughly right if you address a powerful physical effect in a straightforward way, starting with decent data. The data Arrhenius fed into his calculations (based on Samuel P. Langley's measurements of solar radiation reaching the Earth's surface) were mostly in the right range. And Arrhenius included all the obvious physics theory. Yet Arrhenius understood that he had not overlooked any terribly potent effect. Calculations aside, since the atmosphere keeps the surface of the Earth warm — in fact, roughly 40°C warmer than a bare rock at the same distance from the Sun — a few degrees sounded like about the right effect for a change in the atmosphere that modestly altered the balance of radiation. Arrhenius also knew that in past geological ages the Earth’s climate had in fact undergone changes of a few degrees up or down, not many tens of degrees nor mere tenths of a degree. While neither Arrhenius nor anyone for the next half-century had the tools to show what an increase of CO2 would really do to climate, he had given a strong hint of what it could possibly do. A crude idea of how the amount of CO2 could affect radiation was only the first half of a calculation of global warming. The other half would be a model for figuring how the amount of CO2 itself might change. A colleague of Arrhenius, Arvid Högbom, had already published some preliminary ideas. Arrhenhius's 1896 paper stimulated an American geologist and bold thinker, Thomas C. Chamberlin, to look into the planet's carbon system more deeply. In 1897 he published "a paper which, I am painfully aware, is very speculative..." The speculations revolved around the great puzzle of the ice ages. Chamberlin later remarked how ice ages were "intimately associated with a long chain of other phenomena to which at first they appeared to have no relationship." He was the first to demonstrate that the only way to understand climate change was to understand almost everything about the planet together  not just the air but the oceans, the volcanoes bringing gases from the deep interior, the chemistry of how minerals gradually disintegrated under weathering, and more. Other scientists were not awakened. While some admitted that geological processes could alter the CO2 concentration, on any time scale less than millions of years the atmosphere seemed to be unchanging and unchangeable. After all, nearly all of the carbon in Chamberlin’s system was locked up in sea water and minerals. Any emissions humans might produce seemed a negligible addition. According to a simple experiment, there was already enough CO2 in the air so that its effect on infrared radiation was "saturated" — meaning that all the radiation that the gas could block was already being absorbed, so that adding more gas could make little difference. Moreover, water vapor also absorbed heat rays, and water was enormously more abundant in the atmosphere than CO2. How could adding CO2 affect radiation in parts of the spectrum that H2O (not to mention the CO2 itself) already entirely blocked? These studies with the crude techniques of the early 20th century were inaccurate. Modern measurements show that even in the parts of the infrared spectrum where water vapor and CO2 are effective, only a fraction of the heat radiation emitted from the surface of the Earth is blocked before it escapes into space. And that is beside the point anyway. The greenhouse process works regardless of whether the passage of radiation is saturated in lower layers. As explained above, the energy received at the Earth's surface must eventually work its way back up to the higher layers where radiation does slip out easily (in the language of physics, this is the side "wings" of the absorption spectrum, where the gas only partially blocks radiation). . Adding some greenhouse gas to those high, thin layers must warm the planet no matter what happens lower down. Ekholm's explanation was published in a leading meteorological journal, yet it was almost entirely overlooked. Through the first half of the 20th century, hardly any of the few scientists who took an interest in the topic thought in this fashion. They were convinced by the subtly flawed viewpoint that looked at the atmosphere as a single slab. Even Chamberlin concluded that Arrhenius had failed to get his physics right. After all, was it reasonable to imagine that humans could alter something as grand as the world's climate by changing a tiny fraction of the atmosphere’s content? The notion clashed with common ideas that everyone found persuasive. Confident that the climate was self-regulating on any human timescale, scientists readily dismissed Arrhenius’s peculiar speculation about global warming from fossil fuels. While most people thought it was obvious from everyday observation that the climate was self-regulating, scientists had not identified the mechanisms of regulation. They had several to choose from. If the oceans somehow failed to stabilize the system, there was another large reservoir of carbon stored up in organic matter such as forests and peat bogs. That too seemed likely to provide what one scientist called "homeostatic regulation. "(24) For if more CO2 entered the atmosphere, it would act as fertilizer to help plants grow more lushly, and this would lock up the excess carbon in soil and other organic reservoirs. Beginning in the 1950s, a few scientists attempted to work out real numbers to check the idea. They constructed primitive models representing the total carbon contained in an ocean layer, in the air, in vegetation, and so forth, with elementary equations for the fluxes of carbon between these reservoirs. These were only one of a number of "bookkeeping" studies, begun early in the century and increasingly common by the 1950s, that added up the entire atmosphere's stock of heat, energy, and various chemicals. The implicit aim was to balance each budget in an assumed equilibrium. (25) There was little solid data for any of these things, least of all the biological effects. Scientists could easily adjust numbers until their models showed self-stabilization by way of CO2 fertilization, as expected. Regardless of the CO2 budget, scientists expected other feedbacks would regulate the world's temperature. In particular, any increase of temperature would allow the air to hold more moisture, where it would create more clouds, which would reflect sunlight away, moderating the heat and doubtless restoring the equilibrium. Such was the view of no less an authority than the President of the Royal Meteorological Society, Sir George Simpson, K.C.B., F.R.S. In 1939 he explained that "the change in the cloud amount is the predominating factor in the regulation of the temperature of the atmosphere. The atmosphere appears to act as a great thermostat, keeping the temperature nearly constant by changing the amount of cloud. "(26*) That was about as simple as a physical model could get. Yet climates had undoubtedly changed in the past, and slightly more complicated models were needed to explain that. The most widely accepted style of explanation invoked altered "weather patterns." The atmosphere could shift to a different arrangement of winds, lasting decades or perhaps centuries, with different storm tracks and precipitation. Such changes could plausibly be caused by slow geological movements. The raising or lowering of a mountain range would obviously alter winds and temperatures, and opening or closing a strait would of course redirect ocean currents. (27) Perhaps changes of geography were all that geologists needed to explain the major climate changes in the Earth's history. Through the first half of the 20th century, scientific theories on climate change continued to revolve mainly around attempts to explain the ice ages. The explanations by geological rearrangements remained the favorite type of theory, "never seriously challenged," as one authority said in 1922. (29) On the other hand, nobody ever made these explanations precise, and they remained more a kind of story-telling than useful science. An important example of work on the topic was an idea developed by the meteorologist Alfred Wegener in the 1920s. It happened that Wegener loved geology as much as meteorology (he was also dedicated to studies in Greenland, where he disappeared on an expedition in his fiftieth year). In collaboration with another meteorologist, Wladimir Köppen, Wegener worked through the geological evidence of radical climate change. Traces of ancient ice caps were found in rock beds near the equator, and fossils of tropical plants in rocks near the poles. Wegener hoped to resolve the puzzle with his controversial claim that continents drifted about from tropics to Arctic and back. Along the way the two meteorologists worked out a climate change theory. They started off from Arrhenius's idea that the key variable, albedo, depended on whether snow melted or persisted through the summer. The great sheets of ice that reflected away sunlight could persist only if they rested on land, not ocean. So the authors figured that the recent epoch of ice ages had begun when the North Pole wandered over Greenland, and ice ages had ceased once it moved on into the Arctic Ocean. Scientists were beginning to recognize that feedback might grossly magnify the smallest change. The meteorologist W. J. Humphreys, for one, wrote in Atlantic magazine in 1932 that the current situation was close to the conditions where ice sheets had ruled. Thus "we must be just teetering on an ice age which some relatively mild geologic action would be sufficient to start going." As an example, he suggested that if a very wide sea-level canal were built across Panama, currents flowing through it might shut off the Gulf Stream, bringing "utterly destructive glaciation" to Northern Europe. Or dust thrown into the air by a series of volcanic eruptions, like the famous Krakatau explosion of 1883, might block enough sunlight to allow the formation of ice sheets. This ice, scientists now understood, might reflect enough sunlight to sustain the cold. Simpson himself did not resist the temptation to propound a personal theory, which can serve as an example of the general style of argument of the times. In 1937 he pointed out that, paradoxically, an increase of solar radiation might bring on an ice age. The logic was straightforward. A rise in the Sun's radiation would warm the equator more than the poles. More water would evaporate from the tropics and the rate of the general circulation of the atmosphere would increase. This would bring more snowfall in the higher latitudes, snow that would accumulate into ice sheets. The albedo of the ice sheets would cool the polar regions, while wandering icebergs would cool the oceans more broadly. Of course, if the Sun grew brighter still, the ice sheets would melt. Simpson worked out a complicated model of double-peaked glacial cycles, driven by a supposed long-term cycling in the level of solar radiation. (37) It was no more nor less convincing than anyone else's ideas. At a time when scientists could not explain the observed general circulation of the atmosphere, not even the trade winds, theories about climate change could be little more than an amusement. Rossby persevered after he moved to the University of Chicago in 1942 and built up an important school of meteorologists. His group was the pioneer in developing simple mathematical fluid-dynamics models for climate, taking climate as an average of the weather seen in the daily circulation of the atmosphere. They averaged weather charts over periods of 5 to 30 days to extract the general features, and sought to analyze these using basic hydrodynamic principles. The group had to make radical simplifying assumptions, ignoring essential but transient weather effects like the movements of water vapor and the dissipation of wind energy. Still, they began to get a feeling for how large-scale features of the general circulation might arise from simple dynamical principles. (40) In the 1950s, Rossby's students and others moved this work onto computers. Meanwhile a group at Cambridge University carried out experiments with water held between two concentric cylinders, one of which they heated, rotating on a turntable. Their original idea had been to mimic the dynamics of the Earth's fluid core in hopes of learning about terrestrial magnetism. But the features that turned up looked more like meteorology. "The similarity between these motions and some of the main features of the general atmospheric circulation is striking," reported the experimenter. The water had something like a little jet stream and a pattern of circulation that vacillated among different states, sometimes interrupted by "intense cyclones. "(43) It seemed reminiscent of certain changing wind patterns at middle latitudes that Rossby had earlier observed in the atmosphere and had explained theoretically with a simple two-dimensional mathematical model (the "Rossby waves" seen in the meanderings of the jet stream and elsewhere). Following up with his own apparatus, Fultz reported in 1959 the most interesting result of all. His rotating fluid sometimes showed a symmetric circulation regime, resembling the real world's "Hadley" cells that bring the regular mid-latitude westerly winds. But at other times the pattern looked more like a "Rossby" regime with a regular set of wiggles. This pattern was somewhat like the standing waves that form in swift water downstream from a rock (in the real Earth, the Rocky Mountains act as the rock). Perturb the rotating fluid by stirring it with a pencil, and when it settled down again it might have flipped from one regime to the other. It could also flip between a Rossby system with four standing waves and one with five. In short, different configurations were equally stable under the given external conditions. (44) This was realistic, for the circulation of the actual atmosphere shifts among quite different states (the great trade winds in particular come and go with the seasons). Larger shifts in the circulation pattern might represent long-term climate changes. Fultz hoped that this kind of work would lead meteorologists to "the type of close and fruitful interaction between theory and experiment, mostly lacking in the past, that is characteristic of the older sciences. "(45) But in fact, fluid theory was wretchedly incapable of calculating the behavior of even this extremely simplified model system. Anyway the model was only a crude cartoon of the atmosphere, interesting to be sure, but unable to lead to anything definite about our actual planet. The real contribution of the "dishpan" experiments was to show plainly that there was a simple physical logic hidden within the complexities of weather, creating regular climate patterns — albeit disturbingly unstable ones. The behavior of the physical models reinforced a growing suspicion that it was futile to attempt to model the pattern of global winds on a page of equations, in the way a physicist might represent the orbits of planets. This mathematical research plan, pursued ever since the 19th century, aimed to deduce from first principles the general scheme of atmospheric circulation. But nobody managed to derive a set of mathematical functions whose behavior approximated that of the real atmosphere. (46) The huge ignorance of scientists was nakedly visible to the public, which looked with bemusement on the farrago of simplistic theories that science reporters dug out and displayed in magazines and newspapers. Norbert Wiener, a mathematical prodigy, had interests ranging from electronic computers to the organization of animals' nervous systems. It was while working on automatic control systems for antiaircraft guns during the Second World War that he had his most famous insights. The result was a theory, and a popular book published in 1948, on something he called "cybernetics. "(55) Wiener's book drew attention to feedbacks and the stability or collapse of systems. These were timely topics in an era when electronics opened possibilities ranging from automated factories to novel modes of social communication and control. Through the 1950s, the educated public got used to thinking in cybernetic terms. Climate scientists were swimming with the tide when they directed their attention to feedback mechanisms, whereby a small and gradual change might trigger a big and sudden transition. Similar ideas had been alive in the Soviet Union since the 1950s, connected to fabulous speculations about deliberate climate modification  making Siberia bloom by damming the Bering Straits, or by spreading soot across the Arctic snows to absorb sunlight. According to the usual ideas invoking snow albedo, if you just gave a push at the right point, feedback would do the rest. These speculations led the Leningrad climatologist Mikhail Budyko to privately advance worries about how feedbacks might amplify human influences. His entry-point was a study on a global scale. Computing the balance of incoming and outgoing radiation energy according to latitude, Budyko found the heat balance worked very differently in the snowy high latitudes as compared with more temperate zones. It took him some time, Budyko later recalled, to understand the importance of this simple calculation. (58) It led him to wonder, before almost any other scientist, about the potentially huge consequences of fossil fuel burning as well as more deliberate human interventions. In 1963, building on pioneering work by Gilbert Plass, Fritz Möller produced a model for what happens in a column of typical air (that is, a "one-dimensional global-average" model). His key assumption was that the water vapor content of the atmosphere should increase with increasing temperature. To put this into the calculations he held the relative humidity constant, which was just what Arrhenius had done long ago. (60) As the temperature rose more water vapor would remain in the air, adding its share to the greenhouse effect. Crude models of climate change became common during the 1960s, and some of them showed uncomfortably plausible possibilities for disaster. One reason these drew attention was that climate scientists were beginning to admit that there was no such thing as a "normal" climate. By now they had good long-term weather records, and analysis showed that weather patterns did not always swing back and forth around a stable average. The traditional model of a self-regulating balance of nature was gradually yielding to a picture in which climate continually changed. Feedbacks were no longer seen as invariably helpful, ever restoring an equilibrium. Rather, they might push the system into a fatal runaway. The scientists were not causing a change of attitude so much as reflecting one that was sweeping through the world public. Many people were taking up the idea that humanity was liable to bring down global disaster on itself, one way or another. Crude calculations pointed to ruinous consequences from the spread of pesticides, radioactive materials, and above all nuclear war. People no longer saw all this as mere science fiction for teenagers, but as plain scientific possibility. Another expert tallied significant theories about causes of climate change extant in 1960 and came up with 54 distinct hypotheses. When a colleague looked again in 1968, he found the total had mounted to 60. "There is nothing to suggest that an end to the speculation on climatic change is in sight," he sighed. "It seems that we have a long way to go before the correct answer can be affirmed. "(65) The few and scattered scientists who tried to do scientific work on climate change usually distrusted all the primitive models, including their own. Hardly anyone pursued a given idea except the author, who usually just presented a paper or two before moving on to more productive work. As the 1960s proceeded, scientists found it harder to get any respect at all for a physical model unless it incorporated at least a few equations and numerical results. Such calculations, involving ice sheets or CO2 or whatever, became increasingly common, even if the product was often little better than hand-waving dressed up with graphs. As the power of computers rose, people began to think about building models that would work out the whole three-dimensional general circulation of the atmosphere. The main impetus was to predict daily weather, but some hoped eventually to learn something about climate. The early models did give a recognizable climate, but it was more qualitative than quantitative, no close reproduction of the Earth's actual climate. Such models were not easily built, however. One problem was that computers were too slow to handle millions of numbers in a reasonable time. But a worse problem was pure ignorance of how to build a general circulation model. An infinitely fast computer would be no use unless it began with the correct equations for complex effects like the way moisture in the air became raindrops or snowflakes. Many people preferred to keep on developing simple models of climate instability. Such models were easy and satisfying to grasp, and however qualitative and speculative they might be, they offered genuine insights. The best of these insights would eventually be incorporated into the gigantic computer models. Meanwhile some climate scientists took advantage of computers in a less expensive and arduous way, putting them to work on simple models and working out the numbers in minutes instead of weeks. Among various simplified models that were written down in a few equations and run through a calculation, the most important was built in the late 1960s by Budyko. He continued to worry about the climate modification proposals that had concerned Soviet climatologists since the 1950s, the grand schemes to divert rivers from Siberia or spread soot over the icepack. Budyko and his colleagues recognized that existing models were far too primitive to predict how such activities might alter climate. At first, they tried instead to make predictions using the simplest sort of empirical model. They would study past climates, compiling statistics on what had happened during years when the ice pack was a bit smaller, the temperatures a bit warmer, the atmosphere a bit dustier. The way weather patterns had shifted in the past might well indicate how they would shift in response to future interventions. This resembled the traditional weather prediction method of "modeling" tomorrow's weather by looking up maps that represented days of similar weather in the past. The approach was also a natural extension of traditional climatology, with its piles of statistics and its idea of climate change as a simple question of changed weather patterns. To pin down the idea, in the mid 1960s Budyko constructed a highly simplified mathematical model. It was a "zero-dimensional" model that looked at the heat balance of the Earth as a whole, summing up radiation and albedo over all latitudes. When he plugged plausible numbers into his equations, Budyko found that for a planet under given conditions  that is, a particular atmosphere and a particular amount of radiation from the Sun  more than one state of glaciation was possible. If the planet had arrived at the present after cooling down from a warmer climate, the albedo of sea and soil would be relatively low, and the planet could remain entirely free of ice. (In particular, as Donn was continuing to insist, once the Arctic Ocean was free of its ice pack it would be less likely to freeze over in winter). (67) But the Earth had come to the present by warming up from an ice age, keeping some snow and ice that reflected sunlight, and so it could retain its chilly ice caps. That was an extreme example of what the American meteorologist Edward Lorenz had begun to call "intransitive" effects. Under given external conditions, the atmospheric system could get itself locked into one persistent state or into another and quite different state. The choice might depend on only minor variations in the starting-point. These ideas were no doubt provocative, but so blatantly primitive and speculative that few scientists spent much time thinking about them. Scientists tended to be skeptical about this entire genre of models. A mathematical model like those of Budyko and Sellers, built out of only a few simple equations, is quite likely to predict sharp changes. The more complex processes of the real world, however, might become saturated at some point, or react so as to counter any big shift. As one expert later remarked, many in the 1970s thought the Budyko-Sellers instability was a nuisance  "an artifact of the idealized models, and the usual approach was to dismiss it or introduce additional ad hoc mechanisms that would remove it. "(83) The few who pursued the calculations found no easy way to avoid the catastrophic instability, but they understood that it would take a much larger and more complete computer model to produce credible results. (84) Sellers himself developed a somewhat more elaborate model (although it still took only 18 seconds on the computer to work out a year of climate change), and again he got a planet that was highly sensitive to perturbations. But he admitted that resolving the question must wait for some future "super-computer. "(85) Besides, in the early 1970s the public had become agitated about possible climate shifts, and it could seem irresponsible to talk too loudly about world doom predicted by patently deficient models. In 1973, studies in wholly different fields brought new credence to the idea that positive feedbacks could defeat stability, with drastic results. A spacecraft reached Mars and sent back images with dramatic evidence that although the planet was now in a deep freeze, in the past there had been floods of water. Carl Sagan and his collaborators calculated that the planet had two stable states, and ice albedo feedback helped to drive the shift between them. Enormous flips of climate were apparently not a mere theoretical possibility but something that had actually befallen our neighboring planet. (86) For more on the way studies of other planets supported ideas of radical climate change, see the supplementary essay on Mars and Venus. Another field of study produced even more telling news. By the mid 1970s, analysis of layers of clay extracted from the seabed gave unassailable evidence that ice ages had come and gone in a 100,000-year cycle, closely matching Milankovitch's astronomical computations of periodic shifts in the Earth's orbit. (87) Yet the subtle orbital changes in the amount of sunlight that reached the Earth seemed far too small to have a direct effect on climate. The only reasonable explanation was that there were other natural cycles that resonated at roughly the same timescale. The minor variations of external sunlight evidently served as a "pacemaker" that pinned down the exact timing of internally-driven feedback cycles. What were the natural cycles that fell into step with the shifts of sunlight? The most obvious suspect was the continental ice sheets. It took many thousands of years for snowfall to build up until the ice began to flow outward. A related suspect was the solid crust of the Earth. On a geological scale it was not truly solid, but flowed like tar. The crust sluggishly sagged where the great masses of ice weighed it down, and sluggishly rebounded when the ice melted. (Scandinavia, relieved of its icy burden some twenty thousand years ago, is still rising a few millimeters a year.) Since the 1950s, scientists had speculated that the timing of glacial periods might be set by these slow plastic flows, the spreading of ice and the warping of crustal rock. (88) Starting around the mid 1970s, scientists in a variety of institutions around the world, from Tasmania to Vladivostok, devised numerical models that indicted how 100,000-year cycles might be driven by feedbacks among ice buildup and flow, with the associated movements of the Earth's crust, albedo changes, and rise or fall of sea level. They rarely agreed on the details of their models, which of necessity included speculative elements. (89) But taken as a group, the numerical models made it plausible that ice-sheet feedbacks could somehow amplify even the weak Milankovitch sunlight changes (and perhaps other slight variations too?) into full-blown ice ages. Many scientists had converted by now to a new view of climate. No longer did they see it as a passive system responding to the (name your favorite) driving force. Now they saw climate as almost a living thing, a complex of numerous interlocking feedbacks prone to radical self-sustaining changes. It might even be so delicately balanced that some changes would be "chaotic," unpredictable. To be sure, many people stuck to earlier views. In 1976 the Director-General of the United Kingdom Meteorological Office told the public that "sensational warnings of imminent catastrophe" were utterly without foundation. "The atmosphere is a robust system with a built-in capacity to counteract any perturbation," he insisted. (90) That was becoming a minority opinion. While models of ice-albedo and ice-sheet flow gave the most spectacular results, scientists developed a variety of other simple models. The most important and technically challenging models calculated how radiation was transferred through a column of the atmosphere. These increasingly accurate one-dimensional calculations were the underpinning for simplified energy-budget models incorporating changes in ice cover, atmospheric CO2, and so forth. Such models also provided basic elements to build into the proliferating full-scale computer models of the general circulation. In 1972 Stephen Schneider published a suggestive attempt to discuss the complexities in detail. He argued that while a greater amount of cloud cover would lead to net cooling, an increase in the height of the cloud tops would lead to warming. Overall his model was highly sensitive to small changes  not to mention being sensitive to its simplifying assumptions. (92) Further rudimentary calculations showed that all sorts of subtle and complex influences would determine whether a given type of cloud brought warming or cooling. Another problem that needed much more work was smoke, dust, and other aerosols. Tiny atmospheric particles not only strongly influenced the formation of clouds, but interacted with radiation on their own. Some observations and primitive calculations showed that aerosols from volcanoes, and perhaps from human activity too, would have to be included in any realistic climate model. By the late 1970s, groups studying aerosols had built simple one-dimensional models and slightly more advanced models that averaged over zones of latitude. The models gave important results: the net effect of injecting aerosols would be global cooling. Simple models also remained necessary for studying conditions beyond the range of general circulation models. The big models had a problem. Any tiny initial error in the physics or climate data tended to accumulate, adding up through the millions of numerical operations to give an impossible final result. The models gave stable results only when their initial parameters were adjusted ("tuned") until the outcome simulated current conditions realistically within a given range of conditions. Such a model was problematic outside its range. For analyzing climate under current conditions, mammoth supercomputer models took over the field toward the end of the 1970s. The last great contribution of primitive one-dimensional and two-dimensional calculations was to provide a check. The most complex three-dimensional computer models seemed more plausible once they were found to behave much the same as the simple models. Tests using a variety of small models came up with numbers close to the ones printed out by the biggest ones. In short, introducing the myriad complexities of a full-scale model did not change the plain lesson of global warming contained in the elementary physics that stretched back to Arrhenius. A wholly different approach was to "model" the greenhouse world on similar climates of the past. Paleontologists had traditionally studied rocks and fossils to find whether a region had once been jungle, prairie or desert. In the 1980s, Budyko encouraged Soviet geologists to extend this line of work into a detailed mapping of the last warm interglacial period, especially in the territory of the Soviet Union itself. They hoped that this would give an idea of how the world's climate map would appear during global warming in the 21st century. (101) This program was largely overtaken by much more detailed data deduced from studies of ocean floor mud, data precise enough to combine with computer models of climate. Still, the Soviet studies did help to demonstrate that a warmer planet was likely to have a very different geographical distribution of warm, cold, wet and dry regions than at present. A completely different group of simple models was meanwhile joining the discussion. It was essential to understand how biological systems interacted with both global warming and an increased CO2 level. What would changes in gases and temperature and precipitation do to forests, wetlands, and so forth? In particular, what would changes in vegetation mean for the emission of methane gas, the absorption of CO2, or the amount of dust in the air? This was important to climate science because such things could react back on the climate system itself, perhaps in a vicious circle. Specialists in a variety of fields approached the issues with computer models. They plugged in equations and data on such things as how farmers might be forced to change the crops they grew, or how higher temperatures might affect electricity production or wildlife. "Impact studies," as this field came to be called, was rudimentary compared with atmospheric modeling. The underlying data came from only a few acres of woods or fields at a few locations, and the equations did not go far beyond hand-waving. Another and even simpler approach was the one pioneered by Budyko's Leningrad group, finding what the weather had been like in a given region during past periods of warmer climate, and asking how such weather might affect modern life. Here too the data were sketchy, and extrapolation to our own future little more than a guess. (103) What these studies did show was that it was more likely than not that a few degrees of warming would have important consequences for both natural ecosystems and human society  mostly nasty consequences. Nobody would be able to predict precisely how the atmosphere would change, nor what the impacts of the change would be, without understanding all the interactions. Such studies required expertise in botany or agronomy or sociology as much as in geophysics. The climate science community dreamed of a grand model computing every factor together, not just the physics and chemistry but the biology (would trees and grass grow more abundantly and absorb extra CO2 as "fertilizer"?) and economics (would a rise of temperature promote more fossil fuel burning, or less?). Such a comprehensive model lay far in the future. Devising its multitude of component parts would take many years of development using simple models. No less persuasive, Arrhenius and everyone since had calculated that the Arctic must warm more than other parts of the globe. The main reason was that even a little warming would melt some of the snow and ice, exposing dark soil and water that would absorb sunlight. Enhanced Arctic warming was a solid feature of models from the simplest hand-waving to the most sophisticated computer studies. (106*) And in fact, it was in places like the Arctic Ocean, Scandinavia, and Siberia that global warming became most noticeable in the 1990s. The area of ocean covered by ice declined sharply, so did the thickness of the icepack, treelines moved higher, and so forth. Studies mustering large amounts of data from around the Arctic showed that the 20th-century warming far exceeded anything seen for at least the past 400 years. (107) Humanity's "large scale geophysical experiment," as Roger Revelle had called it back in 1957, was producing data almost as if we had put the Earth on a laboratory bench to observe the effects of adding greenhouse gases. The data uniformly cofirmed the basic theories. The best actual scientific criticism came from a respected Massachusetts Institute of Technology meteorologist, Richard Lindzen. Around 1990 he began to challenge the way modelers allowed for water vapor feedback. This was the crucial calculation showing how a warmer atmosphere would carry more water vapor, which would in turn amplify any greenhouse effect. Lindzen believed the climate system somehow avoided that. He offered an alternative scenario involving changes in the way drafts of air carried moisture up and down between layers of the atmosphere. While Lindzen's detailed argument was complex and partly impressionistic, he said his thinking rested on a simple philosophical conviction  over the long run, natural self-regulation must always win out. His work also became, he confessed, "a matter of being stuck with a role." It was important for somebody to point out the uncertainties. Still, nobody could dismiss out of hand Lindzen’s complaint that computer results were based on uncertain assumptions. Although the models passed many rigorous tests, they also showed significant errors, deviating in various details from one another and from the actual climate. Evidently the modelers had not properly represented all the real-world mechanisms. Simple qualitative arguments would continue to be needed for checking the plausibility of any big model. Back-of-the-envelope calculations also continued to be useful for circumstances beyond the range of the big computer models. Tuned to match current conditions, they had a hard time reproducing any situation too different. Above all there was the old problem of explaining ice ages  what conditions made a glacial epoch, and within such an epoch just what drove the cyclic ebb and flow of ice? To be sure, modelers could plant an ice cap on the planet and get a reasonable simulation of an ice-age climate. But that was a static snapshot, not a dynamic sequence showing what made the ice wax and wane over tens of millennia. The usual combination of plausible arguments and simple equations was applied in a variety of models, which now incorporated not only ice sheets but also shifts in ocean currents. (112) Although computers were starting to become capable of handling full-scale models for the ocean circulation, here too there was still room for simple plausibility arguments. Meanwhile ice cores and other indicators showed that greenhouse gas levels during the 20th century were rising much faster than any change detected in the past. Was that why temperatures were likewise climbing, more rapidly than any warming in the past millennium? The big general-circulation computer models with their millions of numerical operations could not reliably churn through a run of ten centuries. There was no way to keep small initial errors from accumulating, a little more each time the model ran through another year, until the whole computation veered off into unreality. But a simple energy-balance model could be adjusted until it responded smoothly to changes in gases, aerosols, and the like in ways that faithfully mirrored the overall average responses of the big models. Thus modeling came full circle, with large computer systems used to calibrate a stripped-down version. The result was some of the most convincing evidence yet that the greenhouse effect was indeed upon us, rapidly growing more serious. (116) No matter how you manipulated any sort of model, if you could get it to simulate the current climate, it was likely to show warming if you put in greenhouse gases.